Violinist Benjamin Schmid, recognized among the 35 greatest violinists of the 20th century, and rising star Diknu Schneeberger, guitar, tracing Stephane Grappelli and Django Reinhardt � from the 1930s on, Hot Club defines a jazz band consisting purely of stringed instruments, which constituted a novelty at the time. 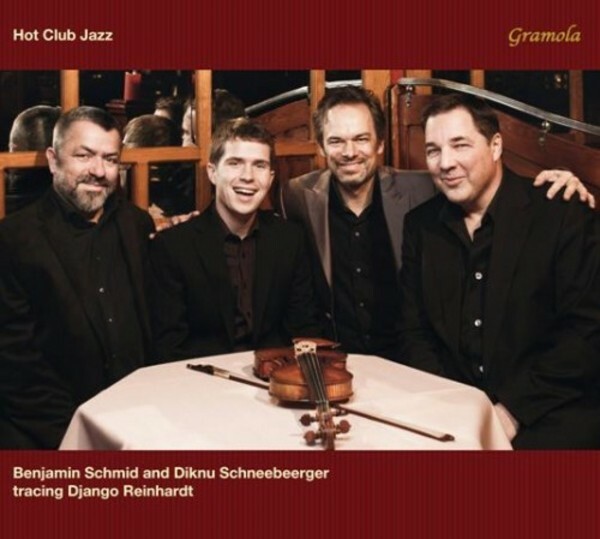 In collaboration with his father Joschi Schneeberger, double bass, and renowned Viennese jazz guitarist Martin Spitzer, the quartet interprets pieces and arrangements by Django Reinhardt, works created in succession by Lulu Reinhardt, Cole Porter or Fletcher Allen as well as arrangements of French chansons. The easy-going interplay captivates with its precision, joy in music and spontaneity. 4. Ou es-tu mon amour? 6. Wake up and Dream: What is this thing called love?